Poet Anne Carson has a special touch, embedding a conversational tone in lilting lines. While Norma Jeane Baker of Troy is billed as a melologue, accepting the spoken and sung word, it asks the question opera composers always ask: what words should be spoken, and what words sung? 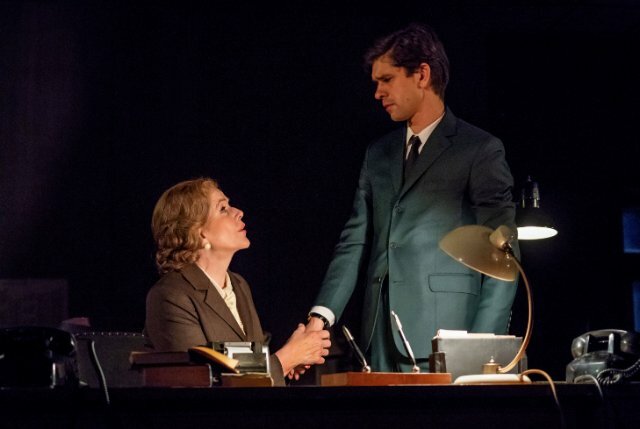 Ben Whishaw plays a writer who comes to the office on New Year’s Eve 1963 to work on his updated version of a play about Helen of Troy. His secretary (Renee Fleming) is called in to type. Snow gently falls outside the windows of his office as it did on that December 31st night up and down the eastern seaboard in 1963. In the Southern United States a violent winter storm raged. 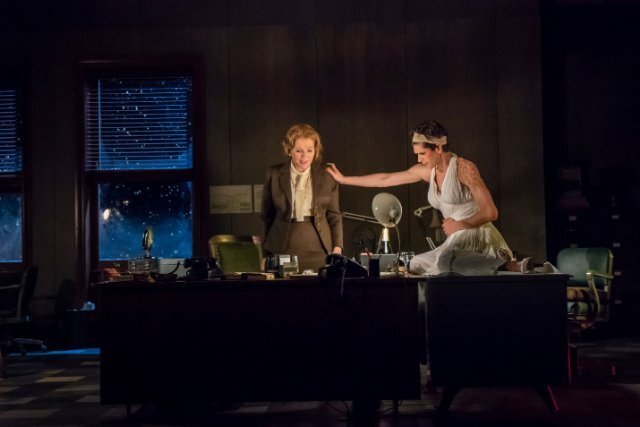 The writer is obsessed with Helen, but his obsession with Norma Jeane Baker otherwise known as Marilyn Monroe overtakes him as the melologue progresses. He will don a bustier, stockings and finally the star’s iconic white dress, although it never is wafted up over a grate as it did in Some Like it Hot. Pungent and moving lines dart out of the script and we move through history lessons woven with a Monroe bio. Both women are seen as victims. We get more detail on Monroe and ‘Arthur” who is of course also a writer. Monroe is not attracted to him. His puckered buttocks turn her off. Paul Clark’s score consists of electronics booming through the theater at the start and more subtly suggesting war, the city and rumbles. All of the material is based on recordings of Fleming's voice, both singing and making click sounds too. Only Fleming’s sung lines are lyric. They display her extraordinary range, and also offer opportunities for emotional heights and plunges. Fleming is very much up to the dramatic role. She is captivating. The musical lines increasingly resemble Olivier Messiaen's in his Nine Songs. Fleming is unforgettable singing them in an urgent desperation at the end. If you are not concerned with subject matter or plot continuity, the production has many compelling moments. You have to abandon a sense of confusion. It is hard to follow the tales of the two iconic women, interwoven as they are. Relax. Enjoy the wild unfolding of a tale of obsession. Consider two women who have intrigued the world through history and of a secretary who turns into an amenuensis and then a muse. Ben Whishaw is a wonderful actor, dictating at first with all the punctuation articulated. You can almost see the words being typed as he speaks. His struggle with the project is palpable. The pictures that are going up on his work bulletin board are of Monroe. They guide him even though Helen remains present in the typewriter and her daughter Hermione, for whom she yearns, is an invisible onstage presence. Katie Mitchell has world-wide fame as a director who can combine various art forms. The challenge here is less that words and songs have to work together than that their meaning is so often obscure. Anne Carson has a terrific sense of humor. Taste her take on Lady Antonia Fraser's announcement to her husband Hugh that she is leaving him for Harold Pinter. The Monroe portrait has a more human potential than simply woman as victim. Monroe had It. She was a natural exhibitionist. Joe DiMaggio, her second husband, refused to go to a Photoplay award event because she was dressed in skintight gold lamé with a rich décolletage. Monroe was intelligent but uneducated; shrewd but not wise. She delivered her humorous lines with just the right pace. Who can forget her search for directions as she wandered a pier trying to find her ocean liner: "Can you tell me how to get to Europe, France?" Or "I can be smart when it's important." A bit more laughter would help. Yet it is a mesmerizing evening of theater, with engulfing music and an intriguing take on history. As Anne Carson responded, when she was asked about the casting, "Ben Whishaw is the best actor and Renee Fleming is the best singer." Anne Carson is also a wonderful writer.